Thank you for joining me as we count down to the MFT release. We are just one day away from the big day! All the new Stamps, Die-namics, and Stencils will be available on Tuesday, October 9 at 10:00 am EST. Be sure to check out the MFT Blog to see all the new items being revealed today. Don't forget to leave a comment on the MFT Blog countdown posts, YOU could win one of the five $75.00 gift vouchers. 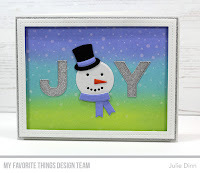 I have a couple of cards to share with you today that feature the fabulous Filled with Joy stamp set and Die-namics. I LOVE this duo of products! For my first card, I die-cut the J and Y from Silver Sparkle card stock, the snowman was die-cut in Smooth White. The hat was created with the gorgeous Black Velvet Paper. I used Shaded Lilac, Tumbled Glass, and Twisted Citron Oxide Ink, along with Sweet Tooth Pigment Ink and the Snowfall Background to create the background. I love using non-traditional Christmas colors. For my next card, I went for a completely different color palette. I created the background with Worn Lipstick, Picked Raspberry, Carved Pumpkin, Abandoned Coral Oxide Ink. I stamped the snow with Sweet Tooth Pigment Ink and then spritzed the paper with a touch of water. The sentiment was embossed on Heavyweight Translucent Vellum. Really cute/pretty cards, and I love both backgrounds so much. The non traditional colors are so bright and beautiful. Nicely done. Beautiful cards. The ink blending is gorgeous. I LOVE your card!!! The background colors are gorgeous and the little snowman is soooo cute. So very lovely! These are wonderful colors and the bold JOY letters in white are so fabulous with them!!! Thanks so much for sharing! Two fabulous joy full cards! Such cute cards - love them both.